Check for Availability and book online now! Looking for things to do in Honolulu? Scaventour™ is a guided live action outdoor escape game that is modeled off of an escape room game, but instead of the game taking place indoors in a private venue, it is outside in public spaces. Like an escape room, players are challenged to open many locked cases and bags in order to find the next location and get to the end within 60 minutes. At times, Scaventour™ will feel like an escape game, but other times, it feels like a scavenger hunt, or a treasure hunt, or even like in a famous code breaking movie, or one about a treasure hunt. People who enjoy geocaching should find that Scaventour is a fun game to play. Book now to enjoy a fast-paced tour experience that is like no other you've ever encountered. Perhaps you have played outdoor scavenger hunts or murder mysteries before. This main Scaventour games are closer to an escape game because you have a guide who acts as the game master (which allows us to give you some neat tools to use to solve the clues (i.e. a laser range finder, a compass, an angular ruler, laser keyboard, etc.)). The guide is very important because he or she allows the game to be complex, but also have help if your group needs it. So, this isn't a self-guided game, rather it is what you would expect to find in an escape room, but outside. We have different games for different size groups. 2 -12 people (adults and children) can play the Duke's Revenge or Tourist Trap game in Waikiki. 10-48 people can play the King's Battle game in Waikiki or Downtown where players will be sorted into teams and will compete against each other and the clock. Good for corporate team building activities. 4-400 people can play the Cryptic Murder game in Central Waikiki (for parties larger than 60 people, please contact us). 16-600 people can play the Double Agents Waikiki Espionage game in which teams will compete to find the identity of the double agent that has infiltrated your agency. For the route based games (Duke's Revenge and Tourist Trap) a guide meets you at a designated spot. The guide gives you a quick brief, then gives you a backpack. All of the pockets are locked on the backpack. Just like in an escape room, you have to open a lot of locks. Inside the pockets are clues. Those clues are relevant at different places in Waikiki. You have to walk to the place, use the clue to help solve a puzzle by looking at the clue and then finding something at your destination that is related to the clue (so if your clue had several bank logos, you might find an ATM at the destination that has those same bank logos ... and your clue would help you figure out how to turn that into numbers). Eventually, the puzzle will yield a combination that will help you unlock one of the locks. Once you open the lock, you will find another puzzle and another destination. The destinations are no more than 100 yards apart. You will walk to the next place and repeat this (some places have multiple puzzles in a single location). You have 60 minutes to walk the 1.5 mile course and solve the puzzles. The team competitive games work a little different. The King's Battle game pits team versus team in a game with real time scoring and a punishing clock. Teams have 5 zones, 5 puzzles in each zone, and 10 minutes to solve those puzzles to get points. Highest score wins. This game normally takes 2 hours to complete. For Cryptic Murder or Double Agents, each team is given a packet with 12-14 puzzles and 90 minutes to manage your time and walk through the area solving puzzles to allow you to determine the identify of the murderer or double agent. Highest Score wins (if only one team, the team that identifies the murderer wins).This game normally takes 2 hours to complete. The larger games are great for corporate teambuilding or building military cohesion. The Battle, Cryptic Murder, and Double Agents games can each be scheduled at any time of day, depending on availability. Mission: The volcano eruption is eminent. Only members of the "Secretive Scaventour™ Society" will be allowed to leave through a special flight arrangement. In order to gain admittance into this historic organization, you must complete the game. A guide will meet you and take you to the start point. You'll have 60 minutes to complete all of the assigned tasks and open the case to earn your membership and get off the island. Are you up for the challenge? Tourists will find that the tours allow you to explore Honolulu and Waikiki in an unforgettable way. Both tourists and residents of Hawaii will find that Scaventour™ is a great way to connect with the local sites. It's a good double date experience as well, or something to do to celebrate a birthday. Escape rooms and scavenger hunts are often used as Corporate Team building exercises because the group must work together to solve the challenges and get to the end. Visitors at the Hawaii Convention Center may be looking for something extra to do while they are on Oahu. Scaventour™ is a great way to get outdoors and enjoy Honolulu while engaged in a group event. Or, check out the option for using Scaventour as a means for surprise proposal idea in Honolulu. A new version of an escape room in Waikiki or escape room in Honolulu, holding the thrill of the escape game without being trapped inside and missing out on the beautiful weather. Great for large groups and group activities in Honolulu or group party ideas in Waikiki. Check out our pictures page to see families and friends engaged in this fun activity together. Scaventour is a walking game, not a running game. Some teams have tried to run, but almost all of them have failed. For teams that have younger players or novices, some of the puzzles are modified to better suit their skill level. Furthermore, there are some additional components of the game that can be added if you have a couple of players as young as 7 playing the game. Would you like to be a Scaventourist? Book here. Prices start at $29 for adults (over 14 years old) and $24 for kids 7-14 years old. This game is in Waikiki and is a walking tour that will challenge you with a series of locks and clues that will engage you with the area like you haven't seen before. Beware of the back alleys and getting sunburnt, but time is limited and you're trying to complete the tasks with little time to spare. A guide will meet you at the Stones of Life on Kalakaua (between the Duke Kahanamoku statue and the Waikiki Police Substation and across from the Hyatt) on the east side of Waikiki. The guide is akin to the gamemaster in an escape room and will assist you as needed. The guide will ensure the game keeps moving and you don't get lost. 4-12 players (6-8 ideal) - Kids welcome (recommended 7 and older). If you would like to do 2 or 3 players, select the private option first and then there will be a dropdown to allow you to choose 2-12 people. If you want an easier version for younger kinds (age 9-13), please let us know and we can make some modifications. Conversely, if you are an expert at escape games, please let us know and we can add an extra layer of challenge to the game. Want to form teams compete? Contact us for more. This game is a walking game. One of the participants will carry a backpack. All participants should wear comfortable shoes. For this game, players can be expected to walk 1.5 miles. Explore the west side of Waikiki in this challenging game. This game is in Waikiki and is a walking tour with a touch of military and Hawaiian history. Experience a series of locks and clues while engaging in Waikiki. Beware of sunburnt tourists and high end shops, and complete the tasks with time to spare. A guide will meet you at the Army Museum at Fort DeRussy (Between the Hilton Hawaiian Village and the Outrigger .... near Hale Koa) and will provide assistance if you need it. The guide is like to the gamemaster in an escape room and will assist you as needed. The guide will ensure the game keeps moving and you don't get lost. 4-12 players - Kids welcome (recommended 7 and older). 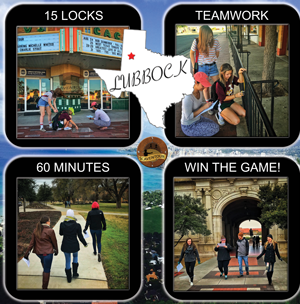 This escape game is designed for up to 5 teams of 8 people each (5-8 per team is ideal). Battle against opposing teams, as well as the clock. Keep your wits, use good communication and strategy and your team could come out on top. This game is the most challenging game with some clues rating 4 out of 4 on the difficulty scale. The game is 51 minutes of game time to solve 26 puzzles, but typically lasts a little more than 90 minutes from arrival to departure. We have one game in Waikiki and on special request, we can run one in Downtown Honolulu on Fort Street Mall. Prices start at $195 per team of 5-8 players. This escape game is designed for up to 100 teams of 3-4 people each. Compete against other teams to determine which of the suspects is the murderer. This game is challenging, requiring teams to strategize, be aware to time managemnet, and solve puzzles with a range of complexity in order to win the game. The game is 90 minutes of game time to solve 14 puzzles. This game is typically played in Waikiki, though we have other options, including a game in Aiea, as well as games that can be held for conferences at the Aulani or Four Seasons resorts in Ko'Olina. Prices start at $107 per team of 3-4 players. Games are $29 for adults and $24 for kids 14 and under. If you would like to book the King's Battle game (for 10-40 people), please call or text 808-373-6869 or email scaventour@gmail.com so we can check for availability of date and time. In most cases, we can adjust the time to fit your schedule. See the Battle page for current pricing. Alternately, if you would like to book a large group (over 40 people) for the Cryptic Murder or Double Agents games, please call. If you see a game that you would like to play at a time it is not offered, please contact us and we can work it out. If you would like to guarantee the booking is private (so other people cannot join you), select the Private Booking option first and then select the number of participants. *In addition to sales tax, you may also see fees through FareHarbor and a credit card charge fee. Scaventour does not currently have a physical address, the guide will meet you at the start point for your outdoor escape game. For maps to the current games, please visit the games page. Looking for a surprise way to propose? With the Scaventour Engagement option, the game can be modified so that the engagement ring is placed in the last box and when you open it, you can "pop the question". Optionally, a photographer can be arranged to be at the finish to take pictures. Contact us about this option. Perfect for surprise birthday parties, anniversary parties, surprise bridal showers, retirement parties, etc. The theme of this game: A madman has placed a bomb in the back room of an undisclosed restaurant in Honolulu and has placed the burden of finding and disarming the bomb on your shoulders. Four or more players will play the game while the rest of your friends, family, coworkers, etc. will wait at the restaurant, ready to surprise the "mark". NOTE: This game is in development, please contact us to find out if it is available. 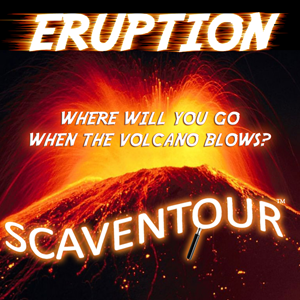 A fun idea for a Children's Birthday Party is to play the Scaventour™ Tourist Trap game. Let your kids play a fun game to celebrate the birthday party in Waikiki. Starts at and ends near Fort DeRussy Beach Park where you can have a separate birthday party. Parties can be from 7 to 20 kids with optional extras available (goodie bags, etc.). Kids must be able (and willing) to walk the 1.5 mile course. Two adults should be present for the game. Looking for a corporate team building activity in Honolulu? 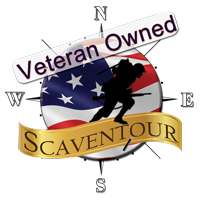 Try Scaventour™ Battle in which 10 teams of up to 10 people each can compete in Waikiki working toward getting to the end goal. This 90 minute game is fun and allows your teams to engaging in communication exercises and strategy while having fun! This is a great opportunity for corporations local to Hawaii, as well as those coming to Honolulu as part of a retreat or convention. See the Scaventour Team Battle Page for more information.